My second-favorite shot of Ani, shot by Danny Clinch. 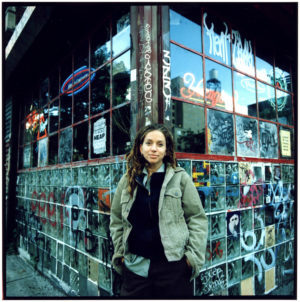 [Patreon-Nov16-Post-Bug][/Patreon-Nov16-Post-Bug]As occasionally problematic and non-intersectional as Ani DiFranco can be, sometimes her willingness to just say stuff makes for compelling, provocative songs. Despite the bombshell opening line, “Subdivision” is not a song exclusively about racial divides, but about Ani’s beloved home town of Buffalo and her beloved country. Her city has seemingly been left behind by a march of modernity. Here, she wonders if that march is just about having the money and privilege to put more space between ourselves and our fears. Maybe if we’re far enough away we no longer have to confront them. Except: when we’ve forgotten, buried, or sublimated all that we’ve been running away from, how will we know when it is stil driving our biases? I had a sense of foreboding when I picked “Subdivision” as my song from 2001 as I prepared for this campaign last month. I’d be posting it just 10 days after the election. I wondered how its message would play in a post-election America, the same country we lived in the day before the election but potentially seen through a new lens. What would it say about a world where Hillary Clinton won the election? What about a world where Donald Trump won? Would it be equally true in both? Now we know the outcome, and I ask that you simply listen and take from it whatever message you hear. That first line will always stand out for me, but in this redefined world it is teaching me something different than it was a few weeks ago.